Combine cucumber and dressing in small bowl. Set aside. Press garlic-pepper seasoning evenly onto beef steaks. Place steaks on grid over medium, ash covered coals. Grill, covered, 9 to 11 minutes for medium doneness, turning once. 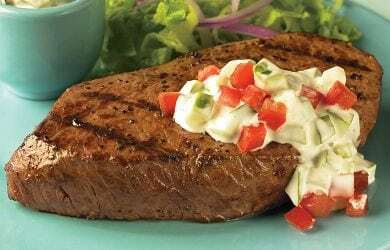 Serve steaks with cucumber sauce. Garnish with tomato if desired.